Shiri Appleby will guest star on the upcoming new CBS medical drama Code Black, Variety reports. Though she is currently only signed on to appear in one episode of Code Black, she is expected to have a multiple-episode arc on the series. Appleby will play Dr. Carla Niven, whose ex-girlfriend Dr. Malaya Pineda (Melanie Chandra) is a first-year resident at the hospital where Code Black is set. Dr. Niven unexpectedly re-enters Dr. Pineda’s life, this time as her patient as a pregnant Dr. Niven—Appleby is expecting her second child in real life—shows up for treatment for muscle pain that turns out to be a side effect of cancer. “She has this ex who shows up and it seems simple, but it turns into something serious,” Code Black creator Michael Seitzman told Variety. “Over the course of Malaya treating her and supporting her, this love story develops, but ultimately, it’s a bit of a tragic love story.” A complicated workplace love story? This sounds like something that Rachel Goldberg—who Appleby plays on Lifetime’s UnREAL—would be all over. Dr. Niven, in fact, is described as a hard-charging ER doctor, which sounds a lot like a doctor version of Rachel. “She’s a terrific actress. It’s a wonderful story,” Seitzman added about Appleby, who also appeared in 10 episodes of ER. This guest-star stint reunites Appleby with Code Black executive producer Marti Noxon, the creator and showrunner of UnREAL. 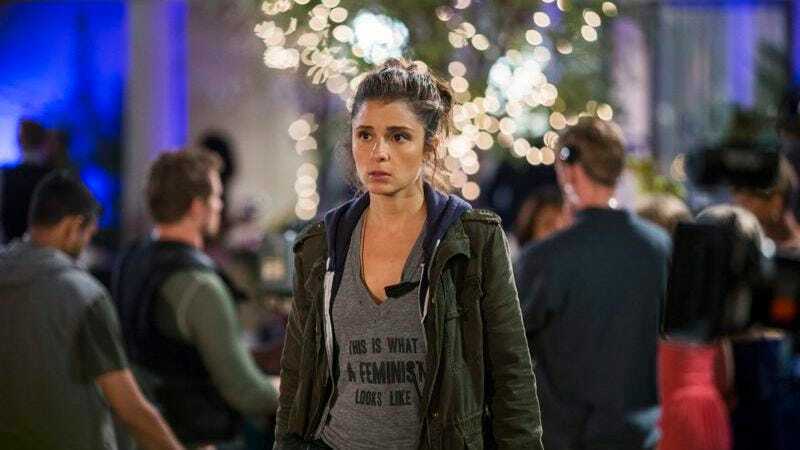 So fear not: Appleby, whose performance on UnREAL is one of the greatest strengths of the Lifetime drama’s first season, will remain a series regular for season two of UnREAL, even though she could be added to as many as eight episodes of Code Black. Fellow UnREAL co-stars Freddie Stroma and Constance Zimmer will appear in the upcoming seasons of Game Of Thrones and Marvel’s Agents Of S.H.I.E.L.D., respectively. Gail O’Grady and Cress Williams are also set to guest star in Code Black, which features an ensemble led by Marcia Gay Harden.